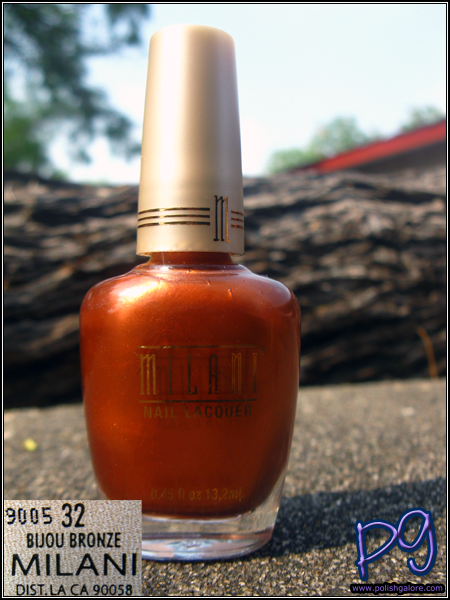 Small break from the Zoyas to give you another brand - Milani. They are currently having a giveaway for a Flip Camera on their Facebook page. Just "Like" them, and then enter on the left hand size where it says "Flip Camera Sweepstakes." Contest ends June 10 at 12 noon PST (which they mean PDT but whatever... I always forget). Bijou Bronze is a brownish red, slightly metallic finished polish (who'd have thought) and applied well. I used a base of Seche Natural, 2 coats of Bijou Bronze and I finished with Milani Quick Dry Top Coat. Oh look, more cloudy weather. BOO. I do love how firey this looks though - very nice. You can definitely see my ridges when not wearing a ridge base. I also apparently got something stuck under my middle nail. And these were all taken before I got a manicure - oops. Overall for my first experience with Milani, this was nice. Good coverage, nice price at $4.50 a bottle. You can visit Milani on their website and purchase directly or buy it in stores like CVS/pharmacy or Walgreens. You can Like them on Facebook, follow their Twitter and subscribe to their YouTube Channel. Now that's a nice colour. It reminds me of Kojak's car. This looks like a UT Longhorns orange-I've got to get that for Fall! Okay, friend told me that this needs more brown to be a burnt orange. I LOVE this brand, I show it in one of my recent posts. The "Disco lights" color. ^follow the link to the post I am referring to where I show my take on the latest nail polish trend!! I love visits, comments, and feedback!